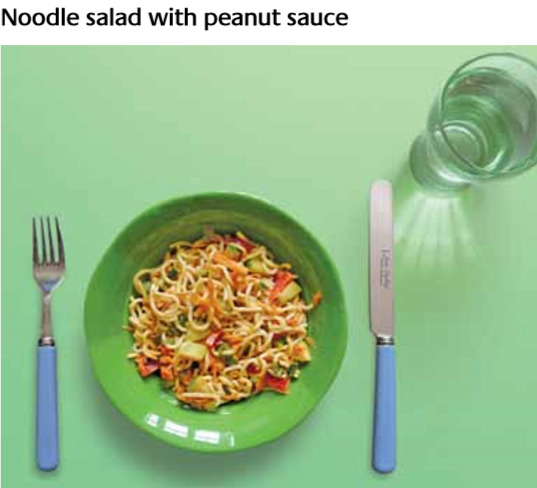 Noodle salad with peanut sauce 230 gm. This recipe makes 4 portions of about 230 gm. Each portion uses 1 noodle nest, 1 tablespoon of peanut butter, 1 teaspoon of soy sauce, ¹/₂ grated carrot, 2cm cucumber and ¹/₄ red pepper. Cook the noodles according to the manufacturer’s instructions. Drain the noodles, run them under cold water and then set them aside to cool. In the meantime, make a sauce by mixing together the peanut butter and soy sauce in a large bowl. Add the carrots, cucumber and red pepper and mix well. Add the noodles to the vegetables and sauce and mix well. Divide between four bowls and serve immediately.